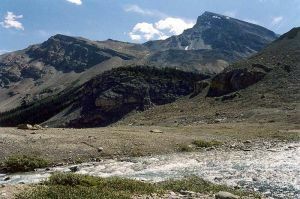 4 km W of Bow Peak, 3 km SSW of the outlet of Bow Lake. The mountain has three distinct summits, the southerly being the highest. Name Notes: Named in 1959 after the glacier on its northeast face, which until one lobe fell off in the early 1900s, had three lobes and was shaped like a corvid's toe.